You might say Cort Scheer is having the best year of his life. He is, in fact, in rodeo. 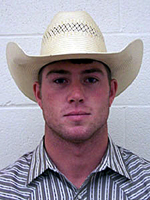 Cort Scheer is heading to his first Wrangler National Finals Rodeo in 2010. On Thursday night at the All-American ProRodeo Finals presented by Pendleton Whisky in Waco, Texas, Scheer rode the Andrews Rodeo horse Peppermint for 84 points to win the progressive go-round. All told, the Elsmere, Neb., cowboy has won $6,177 in the Heart of Texas. “I’ve been really blessed this year,” Scheer told Susan Kanode of Cowgirl Imaging.While the All-American finale doesn’t count toward the 2010 world standings, it’s a nice bonus. Besides, Cort has done very well financially this year, earning better than $82,500. In a sport where dollars equal championship points, it was enough to help him qualify for the Wrangler National Finals Rodeo for the first time in his career. I met Scheer four seasons ago when I was introduce by his then-rodeo coach at Garden City (Kan.) Community College, Jim Boy Hash. In the years since, I’ve been blessed to see him develop. It’s fantastic to see the great ones work their way up the food chain in order to reach the pennacle of the sport. It’s even better to see good people succeed.